12 - 5"x7" pieces double sided. 2 of each design. Found in a little flea market in a hidden corner of the Palais, inside a journal aspired to but never used, we couldn't resist adding these to our journals for ourselves. 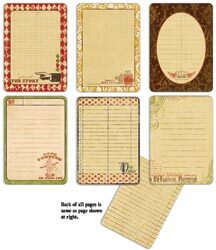 Perfect for journaling and notes of all sorts-do ore than aspire and record your journey.